This past Sunday’s meeting had a decidedly progressive tone, with a panel discussion on the topic of medical marijuana, and a presentation about the OB Rag. The medical marijuana topic had some high-powered speakers – Terrie Best from the San Diego Chapter of Americans for Safe Access; Alex Kreit, Associate Professor and director of the Center for Law and Social Justice at Thomas Jefferson School of Law, and Ebon Johnson, director of the Green Nectar Dispensary. Terrie Best, Alex Kreit and Ebon Johnson. The medical marijuana law at this time does not have adjunct rights, such as employment and parental rights. The growers were not included in the law, making sources for legal dispensaries more difficult and possibly illegal. In addition, legally-certified dispensaries must issue IRS Form 1099’s to the suppliers. The expectation is that the Federal government will change their law to defer to state control. The medical marijuana card is not a prescription, it is a “recommendation”. Marijuana is still a Tier 1 controlled substance under federal law, and cannot be obtained at the drugstore. Because of these inconsistencies, additional laws in California are expected, either through the legislature or the referendum process. The second part of the program was provided by our own Frank Gormlie, with copies of original publications of the OB Rag to display. He provided the history of progressive news in OB and throughout San Diego and his own involvement with the original 1970-1976 OB Rag and other alternative media. 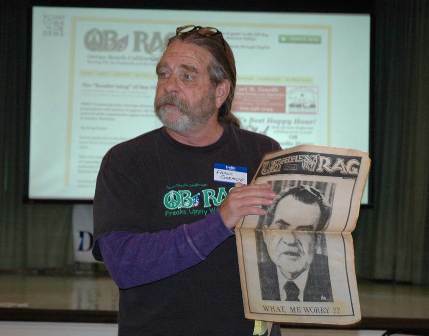 Frank Gormlie holding up copy of original OB Rag with Richard Nixon on cover. The initial motivation for the OB Rag was the Vietnam War and the lack of any news at the local level which provided a progressive point of view. Did you know that Frank was the President of the Student Body at Point Loma High School? His home was then on Catalina Blvd, so Point Loma roots are there. In publishing the current online-only OB Rag, Frank collaborated with his partner, Patty Jones and with Doug Porter. 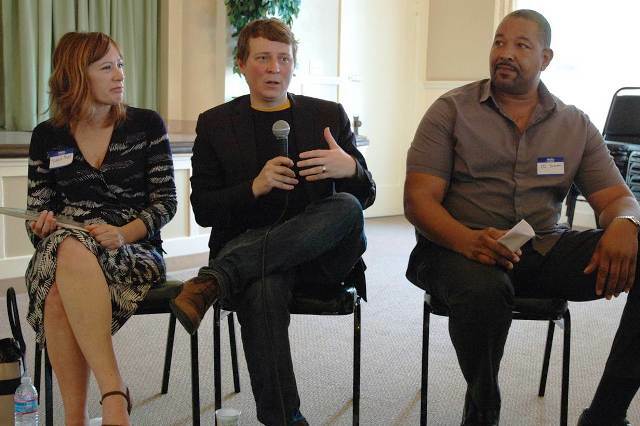 With others they started the San Diego Free Press, founded three years ago, as an alternative liberal press – also only online. Lastly, he reminded attendees that donations and regular contributions are very welcome especially as the OB Rag expands its coverage of Point Loma, and in fact, is needed to cover the costs that keep the mostly-volunteer OB Rag going. The next meeting of the Club is Sunday, May 17, at the Point Loma Assembly, 4:00 PM. 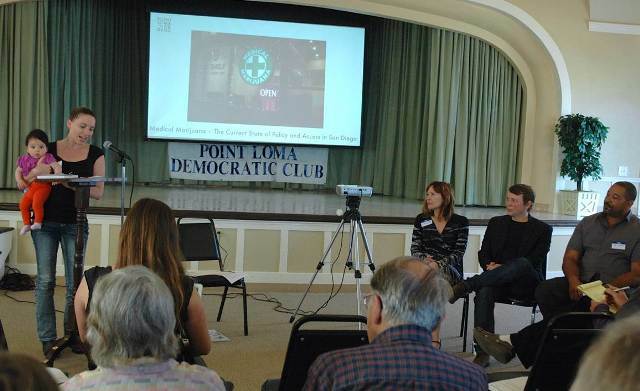 The Point Loma Democrats had so many members with a 92107 zip code, they have modified their unofficial name to be “Point Loma – OB Dems”. Yes, OB need not stay away because of the Point Loma location. In fact, it was a former Point Loma Democrats’ President who sent this message to the Medical Marijuana forum: He had just received his card (from Scripps Institute, no less), but didn’t know how to find a dispensary. Advice was provided. If the growers have no protection and are not regulated, where will product come from? And how will patients know it’s safely grown, provided there are foolhardy growers willing to risk valuable equipment confiscation and prosecution? This all makes no sense. Oh, forgot. This is San Diego. Never mind. Nothing ever makes sense here. I hear you. San Diego ASA has been patting themselves on the back a bit too much. We’ve probably been the least successful major city in making common sense regulations for cannabis reform. The 1000 ft rule is a joke, the 4 per district is a joke and really just a lite ban since at MOST we’ll see a dozen dispensaries open up across the city. Many storefronts of past dispensaries have been vacant for 3-4 years when they could be taxpaying small businesses helping the San Diego economy. They’ve also created a de facto monopoly by only allowing a few legal dispensaries that will be able to charge prices higher than it should it. It makes me shake my head when I think about how it’ll be even more slow and drawn out when we actually legalize it on a recreational level next year.